Nepal is a country of contrasts at the human level of day to day life and existence. One of the poorest countries of the world in terms of its economy and the living standards of many of its citizens and such amenities as 24/7 electricity (‘load-shedding’ affects all parts of the country for often up to 12 hours or more a day, making such matters as traffic lights and warm or air conditioned homes an impossibility; and many unsurfaced roads and lack of pavements on busy streets even in the capital, common), it is at the same time unquestionably, with some exceptions, a land where in some ways quality of life is much higher than in the West. Why is this so? Because struggle (against a backdrop of extreme poverty that is no fault or responsibility of its victims) and a much greater awareness of the interconnection between the spiritual and mundane life exists and thrives — attracting many travellers from across the world to come to this exceptional land — and also a common friendliness in the face of material deprivation, almost completely lacking in average towns and cities in the ‘Developed World’/the West. However, daily life for many ordinary Nepali’s is one that can hardly be imagined by many enjoying and living with material comforts taken for granted in the West. In the image to the left above we find an exemplar of this: three school children going to school — via a rope across a broad deep river with a great drop beneath! This image from a Nepali Facebook news item demonstrates the contrast that exists between, in this case, youth, wanting at the risk of death or serious injury to Go To School! How different is the picture in many Western schools where all too many school pupils are disinterested in what they learn, often in a classroom environment where the latest IT gadgets support and numerous other material study aids are at their disposal. In this we see the contrast of on the one side a society that is very poor in educational amenities, but the desire for learning is so strong, and on the other a society that has all in abundance materially yet is so unhappy because the motivation for learning demonstrated in the picture is lacking. The second picture to top right features Narkumari Gurung, our NIAP’s Womens Equality and Human Rights technical advisor, with colleagues at an important conference event where the urgent topic of womens equality and freedom from being aflicted by discrimination in a range of settings and of levels, is the subject. 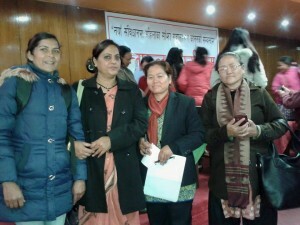 In many parts of Nepal women still face untold suffering from patriarchal and male supremacist modes of relating between the two sexes, including the disincentive and in some cases family and local society contexts of being discouraged fro,m or forbidden to earn and have a job, and daughters being discouraged from going to school because it takres them away from serving in household duties and often heavy manual labour. In daily life therefore poverty and lack of equality at an applied level, involve many Nepali citizens in challenges to quality of life and basic human rights as recognised by the United Nations, in ways unimaginable to citizens of Western nations. In contrast to this we find that despite such challenges, almost all Nepali citizens enjoy a greater awareness of the spiritual in life and that there is an interconnection between Mankind, Nature and day to day existence that means reverance for the spiritual lost in materialist consumerist societies in other parts of the world. 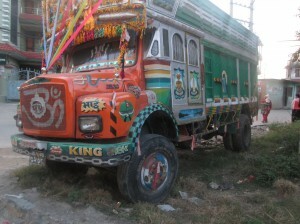 The image above is of a typical Nepali lorry. This is painted and bedecked with spiritual symbols and sacred names and decoration in reverance to Nepali-Hindu deities, and in other cases to Nepali-Buddhist symbols and mantras. 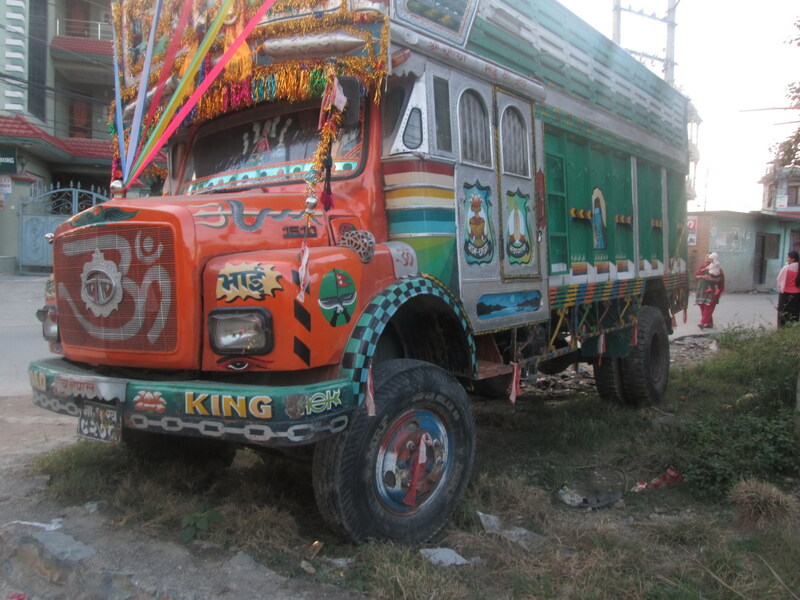 This is not only practical orientated painting art at a very utilitarian level, but symbolises how much reverance Nepali citizens such as the owner and driver of this vehicle has for non-mundane, spiritual values. The story of the role of the arts and daily life is carried further in more detail in the Equality & Empowerment section of the website.